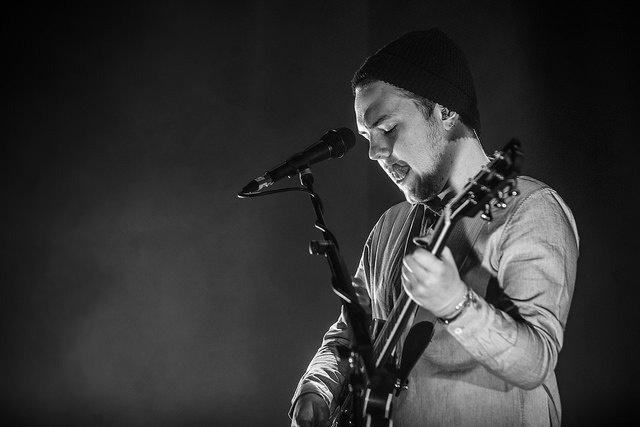 Matt Hitchinson chats to Callum Burrows, better known as Saint Raymond, about his return to music after so long without releasing material. You’ve recently started your new tour – how has it been so far? Callum – It’s been really good thanks, after a long time away from touring it’s great to be back on the road and seeing so many faces at every show. This will be your longest string of shows ever and the first ‘proper’ tour for about three years, does that bring an element of nervousness? C – I think it does, yeah, but I think nerves are good sometimes: it just means that you’re excited for the shows. When you are touring a lot it’s easy for it to become formulaic and not too special, so I think being a bit nervous keeps you on your toes. On the subject of your break from music, what prompted it and what do you think you have gained from it? C – I was doing music every day for about 6 years – touring, writing, recording and as much as I didn’t want to have a break I think my mind naturally just needed a step away. It’s important I think for yourself that you go and do some ‘stuff’ and to have new experiences outside of music. I learned a lot during making my first record and I think that stands me in good stead for this next stage! How did you react to constantly be bombarded with the question of when you were releasing new material every time you posted on social media? C – I understand it! And it’s nice to know that the fans are so eager to hear it. As an artist it can be hard because you are working so hard behind the scenes to deliver and release something good but it’s very easy for it to look like you’re not doing anything! How did your older music fare in the period you were away? Did you find that people still listening and discovering it? C – Yes, definitely! It’s really crazy the way streaming and playlists and all that works now. People can hear and discover your music in all sorts of ways now which is amazing. Even today I had a message from someone saying they’d just discovered my album and would be coming to a show! What made the end of last year feel like the right time to come back to releasing music and how have fans reacted to your comeback? C – It just felt natural for me, I’d been writing a lot and was happy with what I was about to release. The response to the new music was amazing, within a week at shows people were singing back the new songs to me which felt great. Back in the day, you supported Ed Sheeran on his ‘x (Multiply)’ tour, what effect did this have on your career? C – I learnt so much from Ed. From what hard work actually looks like during shows, how to work a crowd during a show and also how to make the most of a support slot by going out to meet people after the shows. It was an amazing experience – playing to thousands of people every night all over the UK and in Europe too so I can’t thank Ed enough. You’ve changed labels, to Gabrielle Aplin’s Never Fade Records, what is different about this new trend of artist-run labels? C – I’ve been doing stuff through Gabby’s label since day one, and it’s been great – these kinds of labels are really important as artists are the people who care the most about the music. My next album is going to be coming out on Cooking Vinyl and ‘Echo’ is my first single with them so it’s great to get the opportunity to work with them also. What was the rationale behind being ‘Saint Raymond’ rather than Callum? C – I just wanted it to feel like a project and I felt it needed a name rather than my own! Talk us through your new single ‘Echo’. C – I wrote this song quite a while ago and it came about in a really natural, easy way. It just felt right to release this song next and as my first release with Cooking Vinyl. The song is about how the differences in a relationship are sometimes the things that can make it work. A lot of your recent material seems more upbeat and hopeful in terms of both sound and lyrics than some of the tracks on ‘Young Blood’ – was this a conscious decision to promote these positive songs over the others or is this a sign of things to come from other future material? C – I think it’s a bit of a mixture, a couple of the latest tunes have a sadder undertone. I wouldn’t say it’s conscious, it’s more just been what I felt like writing at the time. I think the next record will again have a mixture of the two. Your lyrics always match the rhythm of the track really well: does this mean that you write the lyrics after the music to make sure they fit or the other way around? What is your song-writing process like? C – Thanks! My usual writing process does begin with the track as I feel it’s so important to get the right sound to a track. Then I work out the lyrics and the melodies around what is already there so maybe that is why it feels like that. Since your comeback we’ve had a couple of releases – ‘A Light That Blinds’ and the series of ‘Dancing’, ‘One More Night’ and ‘Carried Away’ – can we infer that a second album is on the horizon? C – Definitely. I’ve been writing a lot at the moment towards the next record so it’s a very exciting time and my second album will be released next year. Do you feel like your sound has changed or matured on these releases since your debut album? Naturally I think you mature as a person and your life experiences help influence all of that also. The things that you learn all feed into the music so I would say it has matured but the essence of the songs & sound remains the same. What songs and artists will be the soundtrack for the rest of your tour? Shawn Mendes’ Lost in Japan Remix is on loop in the van, that one is so good. Also been listening to Sam Fender & Eves Karydas quite a lot!